Description: This new courthouse encompasses 550,000 sf and features a 15-story court tower, a six-story office wing on 3rd Avenue and a two-story public cafeteria on 4th Avenue. The most significant engineering challenge this project presented was the government's requirement for electro/mechanical systems that were flexible, easy to operate, energy-efficient and able to provide optimal occupant comfort and indoor air quality. To meet this challenge, Cosentini specified a high-efficiency, floor-by-floor variable air volume (VAV) air distribution system. Low-temperature supply air is distributed to VAV fan-powered terminal units that maintain constant air motion in the occupied space. The fan-powered terminal units, through the induction of warmer above-ceiling plenum air, incorporate a heat recovery feature for use in perimeter space heating prior to the energizing of heating coils. The refrigeration system is provided with a water side economizer for energy conservation. A state-of-the-art building automation system (composed of a direct digitally controlled energy management system, a building-wide security system, and a fire alarm/life safety system) was also included. 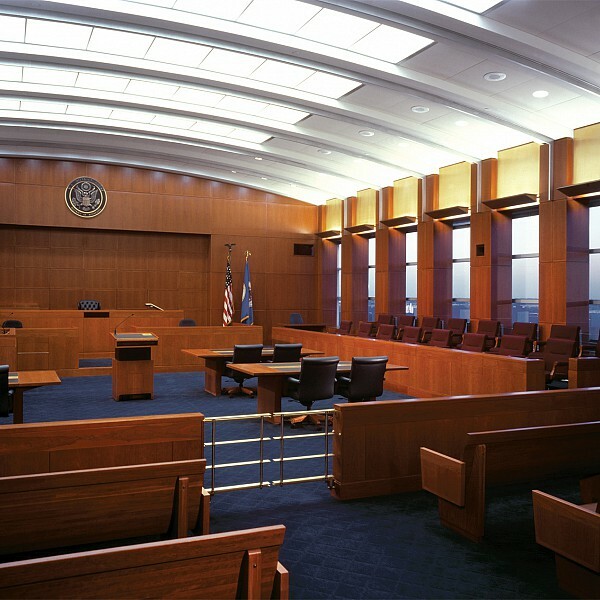 The entire facility meets federal guidelines set forth in the U.S. Marshal’s Standards, PBS-PQ.100, and Court Design Guide.